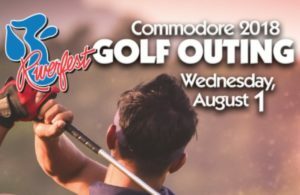 The 22nd Annual Riverfest Commodore Golf Outing will be held on Wednesday, August 1, 2018 at the Trempealeau Mountain Golf Course in Trempealeau, WI. Cost is $100 per person if registered before July 9th and $110 after. Registration fee includes 18 holes of golf, Half of a Golf Cart, Driving Range, Special Gifts, Steak Dinner, Lots of Prizes and On-Course Beverages.